It started with a simple enough proposition. A run, Ben said, down to the Ferry Building farmer’s market. Just a short run, he said, about a mile. We can jog. A short jog, I thought, might be nice! Nice way to see my new city and end up at the farmer’s market. Let’s go. So we went! And went. And went, and went, and went. Roughly three miles and many dirty looks later, Ben and I arrived at the Ferry Building, he unruffled, cool as a cucumber, me gasping for oxygen in strained bursts, my face the color of a vibrant summer tomato. I’ve never been so happy to see a farmer’s market in my life. This one had stalls overflowing with tangy cheeses, piles of orange and yellow citrus, and endless bunches of dark, leafy greens. I was temporarily distracted from the searing cramp in my side by the Californian grandeur of it all – the people, the produce, the pastries! As I sucked in big gulps of air off the Bay, Ben offered to buy me an almond croissant, and, suddenly, all was forgiven. The peace offering complete, we browsed the market, ducking between stalls and choosing fat bunches of dinosaur kale, a large, muddy-bottomed leek, and a few sharp stalks of purple-specked green garlic. After an hour or so, my face had turned from tomato red to what Ben assured me was a healthy, pinkish glow. Right. We took the bus home. Our green market haul went happily into this frittata, along with a handful of creamy goat’s cheese, and was enjoyed by some lovely new San Francisco friends for brunch on Sunday, and then again for dinner on Tuesday. Yep, this one is a keeper. Green garlic is garlic that’s been picked very young, before the bulbs have fully developed, and it very closely resembles scallions. If you can’t find green garlic at your farmer’s market, just use a few cloves of regular garlic, minced up real good. Alternatively, you could also substitute a bunch of thinly sliced scallions. Heat 1 1/2 tablespoons olive oil a medium skillet over low heat, and add sliced leeks and green garlic, stirring to coat. Add a pinch of salt. Cook leeks and garlic slowly, stirring occasionally, until they start to caramelize, wilting and turning light golden in color; this may take about 20-30 minutes. While leeks are caramelizing, butter a 10-inch round baking dish or pie tin. Once leeks have caramelized, pour them into the buttered dish. Return the pan to the stove over medium heat, add the rest of the olive oil, and then the kale. Add a pinch of salt. Gently sauté kale until just wilted and brown in spots. 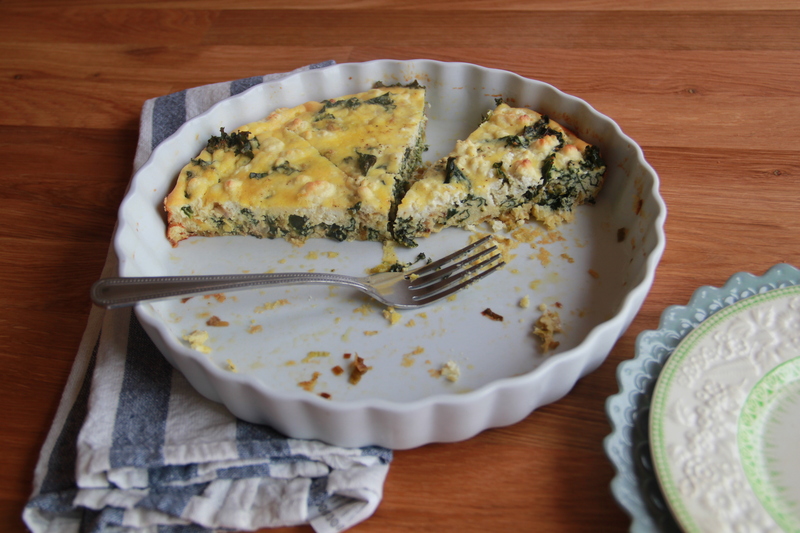 Dump the wilted kale atop the sautéed leeks and green garlic in the baking dish. 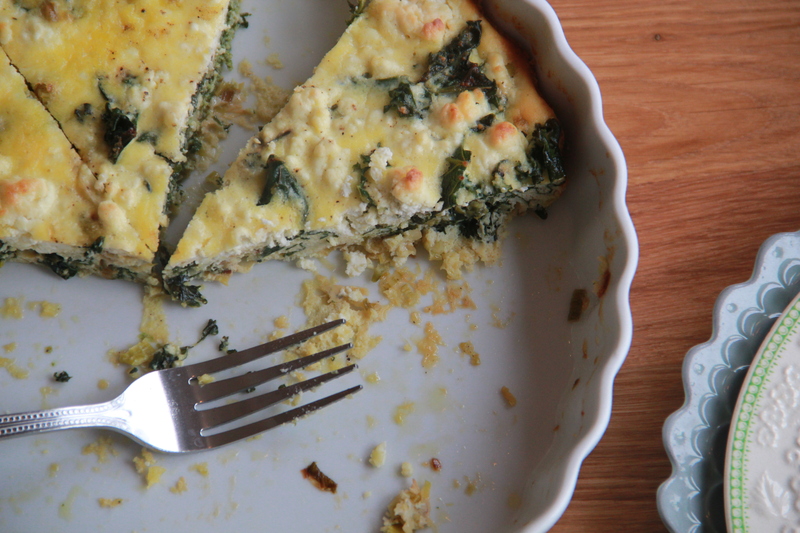 Arrange the goat cheese crumbles evenly on top of the kale. In a large bowl, whisk together the eggs, ricotta, and half-and-half (or heavy cream, if using). Add a big pinch of salt and few grinds black pepper, and stir to combine. Slowly pour the egg mixture on top of the greens and goat cheese, until the baking dish is full. Finish with an extra grind of pepper, and place the baking dish on a sheet pan or jelly roll pan (just in case the eggs run over in the oven). 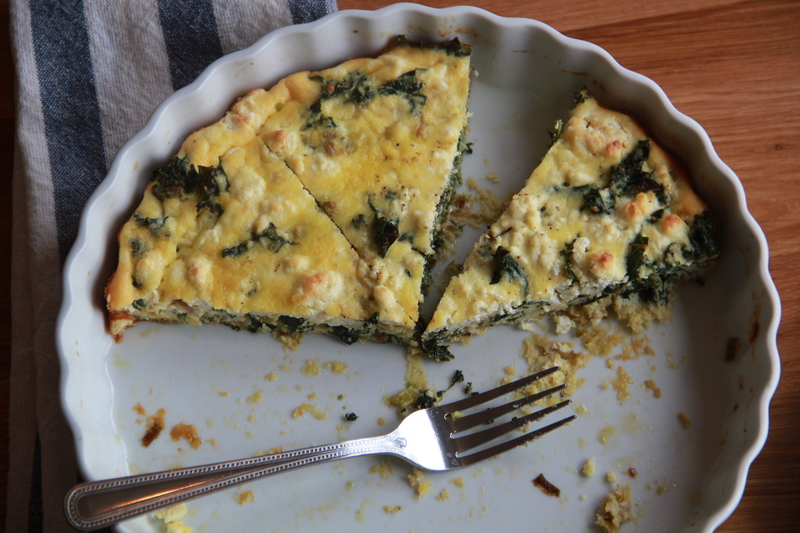 Bake the frittata for 25-30 minutes, until completely set in the center and golden at the edges. Serve, sliced into wedges, warm or at room temperature for breakfast, dinner, or anything in between.